Pineapples have appeared on a list of items banned from this year's Reading and Leeds Festivals, alongside fireworks and weapons. 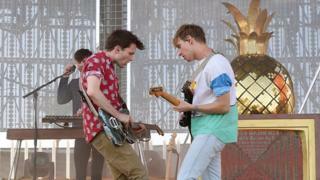 Organisers said it was because fans of Oxford band Glass Animals bring hundreds of the fruit to its gigs, in a nod to song Pork Soda which includes the lyrics "pineapples are in my head". Drummer Joe Seaward said it would be a "challenge" to get in with pineapples. "Anyone who wasn't bringing a pineapple definitely is now," he said. "It's fruitist. Watermelons are fine, but not pineapples?" When the group performed at Glastonbury in June the stage was decorated with pineapples and some fans came dressed as the exotic fruit. Other items banned from the festivals include weapons, fireworks, drones and glass. Where did the pineapple lyrics come from? Frontman Dave Bayley said he overheard a conversation once between a homeless man and someone else on the street in which he thought the speaker said: "Pineapples are in my head." In retrospect he believes he misheard, but he liked the idea, which stuck with him and decided to include it in the song Pork Soda as a nod to the street scene environment. A spokesman for Reading and Leeds Festivals said: "Organisers were a little concerned about hundreds of pineapples turning up on site so decided to ask fans not to bring them along." He added: "The tongue may be slightly in cheek on this one." The BBC has asked the organisers if they have specific safety concerns about the fruit. The annual festival will run between 25 and 27 August.